Oh so lovely. The best 18th ever ( ha! and my only). 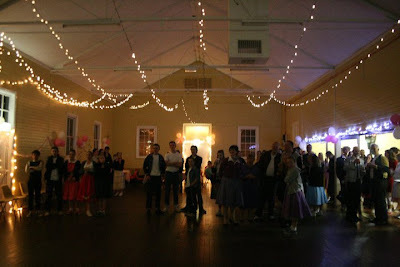 With 50's dancing lessons, a beautiful hall filled with my mates, family and older family friends - who are the ones that really know how to dance. Stuff us younger ones! I don't know if I just know a heck of a lot of people who are awesome old school dancers and love being dags.... but then, that might just be a country thing. Proud Mary and Love Shack was a ripper. Little kids stood in awe of cakes and food. Skirts twirled, gorgeous girls with kitten flick eyeliner and grease-ey haired guys in leather jackets fell repeatedly to the floor, jumping up again to Tub Thumping (.. I get knocked down, and I get up again.. oh you never gonna keep me down). - Yes we cheated - definitely weren't going to stick to 50's music the WHOLE night. 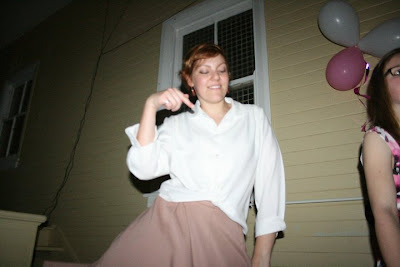 :) And I wore a spotty tulle petticoat, which I was thrilled with. With dancing to Thriller to match. [oh dear. now my whole do is over] now I am over the whole 100 thing (and exam times) I can go on as usual with my blog. Oh this is so lovely! I'm trying to think of a theme for my 21st...I was thinking Grace Kelly-Rat Pack meets Katy Perry-Black eyed Peas...any suggestions?